1. Wash chicken and set aside to drain. 2. Combine the marinade ingredients and rub into chicken. 3. Set aside to marinate for an hour. 5. Add whole spices and bay leaves and when they begin to splutter add tomato puree. 6. Stir well and simmer for about 5 minutes, till tomatoes are semi-cooked. 7. Add chicken with its marinade, mix well and cook over moderate heat for 10 to 15 minutes, till water released from chicken is absorbed. 12. Mix in 2 cups of water. 14. Sprinkle a pinch of garam masala. 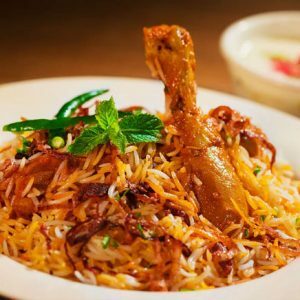 Feel free to comment or share your thoughts on this Saffron Chicken Biryani Recipe from Awesome Cuisine.